New York chain restaurants are now obliged to display calories of their offerings. The result? Fettuccine Alfredo weighs in at over 3000 calories. One of the appetizer option (ribs) is about 2300! Superb news this morning that Radovan Karadzic has been captured by Serbian authorities and being prepared for hand-over to the Hague. I have been holding off on a big post about Mladic and Karadzic that I started after I read the a superb article from the BBC on why Mladic and Karadzic were still free. Karadzic’s arrest is all the more startling in the light of what that article reveals, which is that they were both under the protection of the trans-Balkan mega mafia which includes elements of the Serbian Secret Service and the then government (a kakistocracy1 if ever there was one). Radovan Karadzic was drinking coffee at a remote restaurant on the Foca to Gacko road in southern Bosnia. A short while later, a nervous looking Karadzic and his female companion got up suddenly and left in a red Mercedes. Placing the interests of justice before those of his own fame and fortune, the journalist contacted the International War Crimes Tribunal. …After that, the journalist felt it was time to write his own story, under another name. But first he made contact with Dutch military intelligence, to find out if there had been any follow-up to his information. “Don’t write about it, if you value your life,” he was told, to his amazement. Such is the power, allegedly, of the mafia ring which protects the former Bosnian Serb leader. …Radomir Ceranic, a senior employee of the Bosnian secret service, OSA, described the alleged murder of two CIA agents by Karadzic’s men when they got too close to him. Their car and the tracking equipment they used was discovered. The bodies of the CIA men, both US citizens, were never found. Ceranic had just been fired from his job, so he may have borne a grudge. Whatever the truth, it is another hint of the power and ruthlessness of Karadzic’s network. Ever since Prime Minister Zoran Djindjic was murdered, Serbian politicians have been very aware that they are at the mercy of the regional mafias. Here is Serbia handing over Mladic and Karadzic was not considered to be political suicide for the politicians who order it, but literal suicide. The joke in corridors of my office today is that new Minister of Police (and leader of the Socialist Party) Ivica Dacic has been set up. He fought hard to get that ministry and now he is being credited/blamed with the arrest itself. There is something poetic about this in the eyes of many because the Socialists are widely believed to be involved in murder of Djindjic. Now its expected that he is in the sights of the mafia revenge squad. Some ministries have gone so far as to deny any involvement2. People are also wondering just what the hell he was doing on a public bus in the suburbs of Belgrade. His disguise was pretty good though (see photos above). 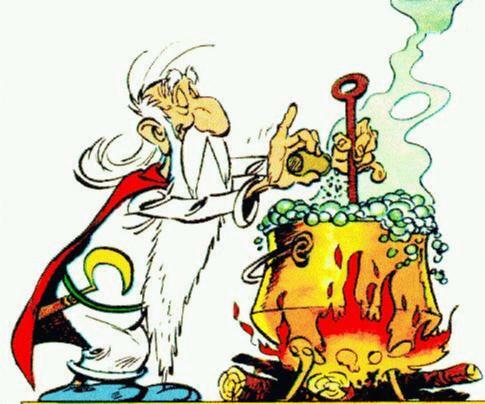 Serbian newspapers are joking that he looks like Santa Clause or Getafix [image] from the Asterix comics. The global consensus seems to be that this is superb news and just about everyone here that I have spoken to is delighted. This arrest also seems to indicate that the Secret Service is under control. In “What’s Wrong With Serbia?” analyst Dejan Anastasijevic explored the massive power of the renegade elements within the Serbian Secret Service. Reproduced below is Stratfor’s assessment of the implications of the arrest3 . Note the comments on Kostunica. The arrest of war crimes suspect Radovan Karadzic has major implications for Serbia. Radovan Karadzic, alleged to have committed war crimes during the Bosnian portion of the Yugoslav wars, was arrested July 21, according to the National Security Council of Serbia and the Serbian president’s office. Initial reports indicate he was arrested in Serbia, not Bosnia. Karadzic has been in hiding since the Dayton Accords, which ended the Bosnia war, were signed in 1995. Karadzic has been able to remain at large thanks to the intelligence and security forces of Serbia, which have continually turned a blind eye his way. Many of a nationalist bent in Serbia disagree with the conventional wisdom that most of the violence in the Yugoslav wars was carried out by their co-ethnics, and many of the remainder feel that Serbs were treated unfairly. Regardless of where the blame does, should or will fall, the bottom line is that many were willing to provide Karadzic shelter despite a continental manhunt seeking to place him before a war crimes tribunal. That all changed two weeks ago with the installation of a new government in Belgrade. Until recently, the BIA — Serbia’s internal intelligence agency — was directed by the former prime minister of the country, the mild nationalist Vojislav Kostunica. Kostunica and his party are no longer in the government. Also, the Socialist Party of Serbia — the party once run by former Yugoslav President Slobodan Milosevic — has essentially sold itself to the highest bidder in an effort to rebill itself as a “modern, European” party. The BIA’s change of hands and the Socialists change of mind enabled Karadzic to be arrested. His transfer to the tribunal in The Hague will likely happen within days. There are four main implications of this decision. First, it greatly discredits Kostunica and his allies in the eyes of the West. Many Western governments already disliked Kostunica’s kingmaker role, as he used it to extract endless concessions out of the European Union. Now, most will believe that Kostunica’s allies knew Karadzic’s whereabouts all along, and most will be unwilling to so much as entertain any proposals Kostunica may have. Second, the arrest and transfer will provide the perfect launch for Serbia’s efforts to join the European Union. War crimes cooperation has long been a sticking point with many of Europe’s more moral-minded members — especially the Netherlands. Serbia now may be able to leverage that to push itself closer to Europe. Serbia used to be an economic hub, enjoying good infrastructure and an excellent location on the Danube. It now has an excellent chance to be that hub again. long-standing policy. Serbia’s road is far from easy, but its leader is proving to the world that he has the right mix of skill and stubbornness to chart a bold path. Finally, Serbia is overcoming its past 20 years stuck between Europe and Russia, and is sliding toward the former. The biggest criticism of Serbia — many Europeans have long held — is that Belgrade has been unwilling to come to terms with its recent past and the role played in the Yugoslav wars. If the new government is willing to do this, it has already done the hard part. After all, coming to terms with one’s past is far easier than negotiating with Brussels’ bureaucrats. A hungry dog retrieves plastic rubbish from a polluted and an algae covered section of Sava river near Belgrade. As though things could get any worse for Belgrade’s Sava river-side, now a massive (and in my experience) unprecedented algae bloom is underway. The entire bank of the Sava from the confluence to Ada has algae between 1 and 5 meters out. Ada marina lake is almost completely covered. The Sava River, the largest and most commercially valuable water body in the riparian countries, receives inputs of organic and inorganic compounds from a variety of domestic and industrial activities that may affect the health of human beings and wildlife. In this work, the chronic toxicity of sediment, sediment porewater and surface water from the Sava River and connecting tributaries to the freshwater algae Pseudokirchneriella subcapitata was assessed to characterise the potential impact on aquatic organisms. Samples of different environmental matrices were either tested directly (porewater) or subjected to pre-concentration (sediments and surface water) prior to testing in a 72 h growth inhibition assay using P. subcapitata. The results show that a combination of pre-concentration and bioassay testing was able to characterise the toxic potential and to identify several compartment-specific "hot spots" along the Sava River. Based on the resulting data, a crude risk assessment identified that some of the locations may represent a risk to algae. Additional testing using multiple species and exposure phases is required to conduct a thorough risk assessment, however. Organophosphate pollution is the main cause of these blooms. Incidentally, algae is causing mayhem at the Olympic sailing venue in Qingdao, China. Third, the Serbian leadership — specifically President Boris Tadic — has demonstrated remarkable political acumen. For the past three years, Tadic routinely has outsmarted and outmaneuvered Kostunica. But beginning just a few weeks ago, Tadic began turning the tables. Now that Kostunica is out of government, Tadic’s allies are firmly in charge. Tadic commands the most unified government Serbia has known in years, and he is breaking with long-standing policy. Serbia’s road is far from easy, but its leader is proving to the world that he has the right mix of skill and stubbornness to chart a bold path. Homosexuality may persist because the associated genes convey surprising advantages on homosexuals’ family members. Thanks to Abelard for the heads up. The F22 Raptor fighter jet took to the skies at the Farnborough air show. The US Air Force aircraft is made by Lockheed Martin, and is arguably the world’s most sophisticated fighter jet. Serbian politicians and their Kosovo Albanian counterparts tend to have nothing to do with one another – but at Belgrade’s bus station you discover this does not apply to everyone. “they were a good unit but they shouldnt of filmed what they did because it makes us srbe look bad” – unknown commenter quoted by Sarah Franco in her superb post the banality of evil in Serbia. Sarah Franco was rightly horrified that the person quoted above did not regret the Srebrenica massacre or the Scorpions killing Muslim teenagers, but rather that they had been caught, they were foolish enough to film themselves and therefore make Serbia look bad. The 2004 he is referring to is the explosion of Ethnic Violence meted out by Albanians to the tiny Serb minority. As Totten notes, “Dozens were killed. Hundreds were wounded” but Mr Berisha is not sorry about murder, looting and wanton destruction of ancient churches, instead he is sorry because it made Kosovars look bad and set back their political ambitions. Mr Berisha charitably hoped that “not all Serbs are bad” and Michael assured him that he met “a handful” of terrific Serbs. So there you have it folks, not all Serbs are bad, just most I presume? Or is it just the majority? I mean if it were a minority one would expect the comment to be “Not all Serbs are good”. No? Luckily, the “Not all x are bad” cliche seems to apply to just about everyone. That said, it seem to be a big favourite with racists and extremists. A quick Google reveals one charitable racist informing us that “Not all blacks are bad but not all tigers are killers” 3 . “Not all blacks are bad…I’ve met a few decent ones in my day. Such as my high school principal” says another Stormfront racist 4. Not all Jews are bad 5 too apparently, and I am delighted to report that not all Muslims 6 nor white people 7 nor Americans 8 are bad either. What strikes me is the type of people who tend to use that phrase in earnest. The sort of people who frequent Stormfront. Enough said. Here follow some more quotes from Michael’s article and my comments. This is not quite accurate. Those wars were wars of secession “kicked off” by the nationalist separatists in Slovenia, Croatia, and Kosovo, whilst Bosnia was a civil war. Occasionally one hears – usually in disreputable online venues – the old canard that “Serbs started and lost 4 wars”. When you do, you know you are in the realms of historical ignorance and it is best to break off further discussions. Unless, that is, you are a Serb or Albanian in the wrong place at the wrong time. “We are more pro-American than you are,” one young Kosovar told me. Nah, people the US have bombed unjustly and continue to abuse liberally. There we have it again. There are some Serbs that are good but the presumption and tacit statement is that most are not. Again, it is only with Serbs that one can get away with this sort of casual bigotry. If I were to claim that merely some blacks, Jews, Muslims, whites or Americans were good I would be denounced as a bigot. Hey, I love those Israelis too (the vast majority them – like Kosovars – are good), but I have news for you Luan. The Israelis are one of the 149 countries out of 192 that have NOT recognized Kosovo . Only 43 countries have so far. Do you think it is because they all love Serbs? Could it be that they are deeply disquieted by the illegal and bullying manner in which the entire situation has been managed? Could they be wary of US foreign policy “results” post-Iraq? Could they be genuinely worried that Kosovo is a terribly dangerous precedent? Incidentally, what the Israelis ARE doing is pouring hundreds of millions into Serbia 15. How does that square with the Serbs-as-anti-Semites libel one keeps seeing popping online? Some of the people I spoke to were returning from Belgrade hospitals, either as patients or carers. The patients had been receiving treatment for serious conditions, which they could not get in Kosovo. Those doctors must be some of those handful of decent Serbs. I just wish a handful of unbiased and historically well informed journalists would visit the region and take the time to give Serbs a voice. Who knows they might even find out that not all Serbs are good, but the vast majority are. Some interesting points from a recent presentation by Sanjay Kathuria, an economist with the World Bank, address Serbia’s economic future and underscore what my colleagues and I have been saying for three years: Serbia needs to use the highly qualified and relatively inexpensive workforce to earn revenues on the open market through outsourcing. One of the keys to this lies in reform of the Vocational Education & Training (VET) system (superb work is being done here by EU CARDS) and the creation of an infrastructure to support outsourced operations. I also think Mr Kathuria is absolutely right about regional normalization and deeper integration. Serbia’s exports are among the lowest in the Balkans, and an increase should be a priority, a World Bank report says. This export increase should come based on highly qualified labor, said a presentation in Belgrade today of the World Bank report on the integration of the western Balkans and the European Union. Kathuria also stressed the need for a deeper integration of western Balkan countries, so that these markets could become more competitive, and in order to improve the quality and reduce the prices of goods and services, which would in turn help toward a speedier integration into the EU. The region should also reach agreement on the free passage of workforce, Kathuria said, and suggested this be done at first on a bilateral basis, accompanied by bilateral agreements to recognize professional qualifications.